Brazil food is delicious and amazingly diverse. These are some popular Brazil foods in different regions of the country that will make you want to visit and enjoy them! Choices of Brazil popular foods are eaten throughout the country of Brazil and include pine nuts, yams, acai, cassava, hog plum, okra, peanuts, cheese bread, tapioca, and chourico, which is essentially a spicy sausage. Brazil's staple food items consist of feijao, or black beans, farinha, which is similar to what we know in the U.S. as flour, and arroz, or white rice. These three ingredients are typically cooked or served with protein such as fish, red meat, or poultry. The national dish of Brazil is called feijoada. It's a hearty meat stew made from pork and black beans. Traditional side dishes served with feijoada are kale, ground manioc, orange salad, and arroz. Each region of Brazil boasts its own style of cuisine. Each region's cuisine has been heavily influenced by the diverse history of origins, which came from both the immigrants and the indigenous people of the country. The Northern region of Brazil includes Tocantins, Rondonia, Acre, Amapa, Roraima, Para, and Amazonas. The people who live here are a mix of Portuguese and Indian. You will find foods like manioc, a root vegetable, peanuts, fish, peanuts, and tropical fruits eaten in this region. When I visited Amazonas and traveled through Rio Branco and Boca do Acre, the meals we found at resterants were rice, beans, manioc flour and red meat, sometimes with a lettuce leaf or tomato. Vatapá - a spicy, delicious mixture of bread, shrimp, red pepper, ginger, peanuts, coconut milk, palm oil and onions. Tacacá - a popular soup made from jambú, a type of paracress (Brazilian herb), dried shrimp, yellow pepper and tucupi, a broth made of manioc root. Maniçoba - a dish made with the leaves of the manioc plant that is often eaten during religious festivals. Leaves are ground to a pulp and then boiled for a week, and added to dried, salted or smoked meats and served with rice and farinha or cassava meal, which is also known as manioc root or macaxeira. Pato no Tucup or Duck in Tucupi Stew, a stew made of duck boiled in manioc root broth. Caruru is a Brazilian condiment that is made with okra, onions and shrimp, palm oil, and toasted cashews or peanuts. It is frequently enjoyed with acarajé, which is deep fried black eyed peas. This region includes Santa Catarina, Parana, and Rio Grande do Sul. People of Italian and German descent who immigrated to Brazil inhabit the South of Brazil. They brought the knowledge of how to make wine and grow leafy vegetables with them and those foods are found in this region's dishes. Arroz Carreteiro - the literal translation is "Rice Wagoner" or "Cart Riders", and it is a mixture of meat, rice, tomato, onions and spices. Barreado - is a very popular meat stew that is simmered with spices for up to 18 hours and then served with rice, mandioca flour and fried bananas. The stew is mixed with generous amounds of the mandioca flour and broth, and then eaten with the rice. This mixture doesn't look very appetizing and so visitors to Brazil sometimes eat the meal without the customary "pre-mixing"! The Northeast region of Brazil includes Sergipe, Alagoas, Piaui, Maranhao, Ceara, Pernambuco, Bahia, Paraiba, and Rio Grande do Norte. Popular dishes here are heavily influenced by the origins of Amerindian, African, and Portuguese cuisine. 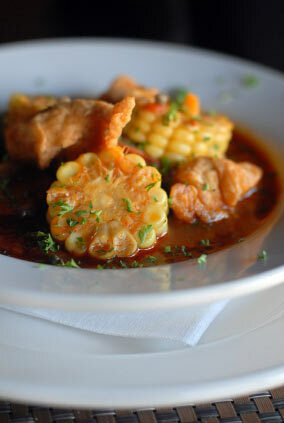 Moqueca - literally translated means "stew" and is a seafood stew that has been made in Brazil for over 300 years now. It contains fish, garlic and onions, olive oil, cilantro, tomato, peppers, and is cooked slowly without added liquids. Variations of this stew are made in different regions of Brazil. Some use coconut milk, crab or shrimp, and palm oil instead of olive oil. It is generally served with rice. Acarajé is made from black eyed peas that are rolled into a ball and fried, and stuffed with condiments, salads and sauces. Some fillings contain shrimp, some are vegetarian. This dish is a populra street food in Brazil, and is also eaten in Nigeria for breakfast with corn or millet gruel. Vatapá - This mixture of bread, coconut milk, shrimp or other white meat, peanuts, shrimp and palm oil is enjoyed in other regions of brazil as well. In the Northeast it is enjoyed with acarajé. Staple foods are ones grown or found locally and might include tropical fruit such as mango, guava, passion fruit, papaya, orange, and pineapple. Other popular ingredients for all kinds of dishes are okra, black beans, white rice, coconut, seafood and shellfish. This region of Brazil includes the states of São Paulo, Minas Gerais, Espirito Santo, and Rio de Janeiro. Within this region, there are specific dishes a few of the states are known for serving. São Paolo is the largest city in Brazil and it is the most "westernized" in its culture. When I was there, it was a unique experience that felt a little like being in the United states except with the rich and vibrant culture of Brazil. The population is quite diverse and their food choices also reflect this. 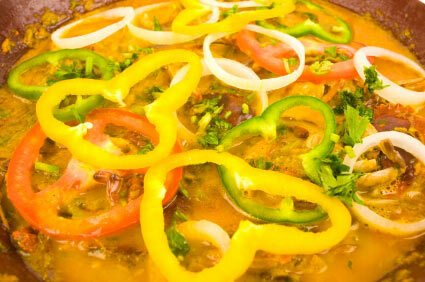 Moqueca Capixaba is a variation of Moqueca which uses olive oil instead of palm oil, and does not use coconut milk. The stew contains onions, cilantrol, chives and tomoatoes. In this version a pigment called urucum is added to the stew and it is cooked in a clay pan. The stew can be made with fish or other seafood like lobsters, shrimp or crabs. Some versions use raw bananas. Cut the raw bacon strips into large pieces and fry them at medium-high heat setting in a large pot for about 3 minutes. Don't let them stick to the bottom of the pot. Reduce the heat setting to medium. Dice the onions, peel and chop the garlic, and add both ingredients to the pot with the bacon. Cook until the onions become soft, which is about 3 minutes. Cut the beef and sausage into bite-size pieces and add them to the pot. The meat should be cooked until all sides of the meat are browned. Add the stewed tomatoes and juice, water, mustard, and salt and pepper to your desired taste. Turn the temperature setting down to simmer and cover the pot. Cook the entire stew for about 45 minutes. Stir it often to meld the flavors. Add water if the consistency is too thick for you. Don't add more than 1/4 cup of water at a time. After the stew has cooked for 45 minutes, add the black beans and juice and stir. Return the cover to the pot and cook for another 10 minutes. This hearty Brazil food recipe serves 10-12 people.